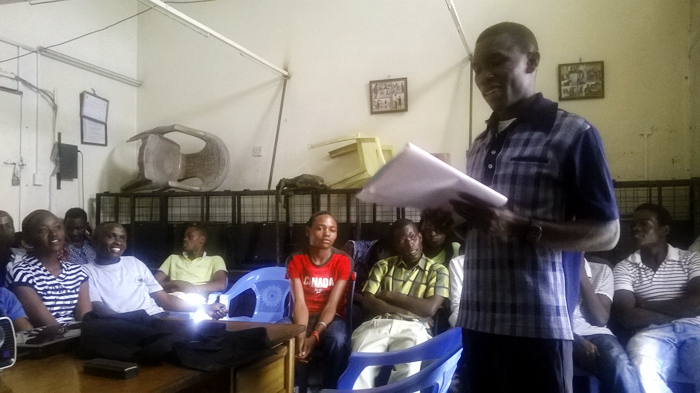 On 12th October 2014 we were honored as Wi team to facilitate a session at Maji Mazuri during their regular meetings which was attended by 30 at their offices located in Mathare. The Maji Mazuri Youth group has programs seek to address the root causes of poverty and focus on alleviating poverty by empowering people to bring about change in their own lives. The session addressed issues that affect the young people which hinder their progress in achieving their desired future. The session took an open and participatory approach rather than direct lectures, whereby most of the answers came from the participants who are residents of Mathare and its environs. Myths: No future, not educated, idlers, witchcraft etc. Truth: Talented, champions of life, high level of school drop outs, jobless etc. At Wilsen Initiative (Wi) we address these gaps in the society by creating or bridging solution finding from within especially targeting the young people who are vulnerable to economic, social and political issues. We challenge the youth to be agents of positive change and also be part of the solution through utilizing their God given talents and skills acquired in any field of interest. One of the participants presenting during group assignments focusing on Myths, Facts and Perceptions about youth from Mathare and its environs. At Wilsen Initiative (Wi), inspiration talks is one of our outreach activities hosted by either a youth groups, schools etc. Thanks to Wilson for the great facilitation, Kamuzi and Kennedy for coordination and support and lastly Wambua for the invitation and playing host. We look forward to more engagements with like minded institutions and it only through knowledge sharing we will reach the future which everyone desires. Written by; Ms. Evaline Akida.